Home Sports What If The National League Had A DH? What If The National League Had A DH? For a brief moment this winter, it seemed like the designated hitter might finally come to the National League. The MLB players union proposed the idea to the commissioner’s office as part of broader negotiations, but last month Rob Manfred pumped the brakes. Adding the universal DH was not part of the agreement between the union and owners reportedly reached Wednesday. The leagues will keep their different rules for now, even if there is a growing sense that the DH’s arrival in the NL is inevitable. As MLB continues to debate its rules, we wanted to quantify what a universal DH would mean for the game. So we looked to the American League, where they’ve been playing with a DH since 1973, not entertaining double-switches and skipping the added layer of decision-making regarding when to pull the starting pitcher. When we rummaged through the data, something surprising emerged: The NL already looks a whole lot like the AL. What would a universal DH mean for offensive production? The DH’s most obvious effect is that with it, pitchers don’t have to bat. 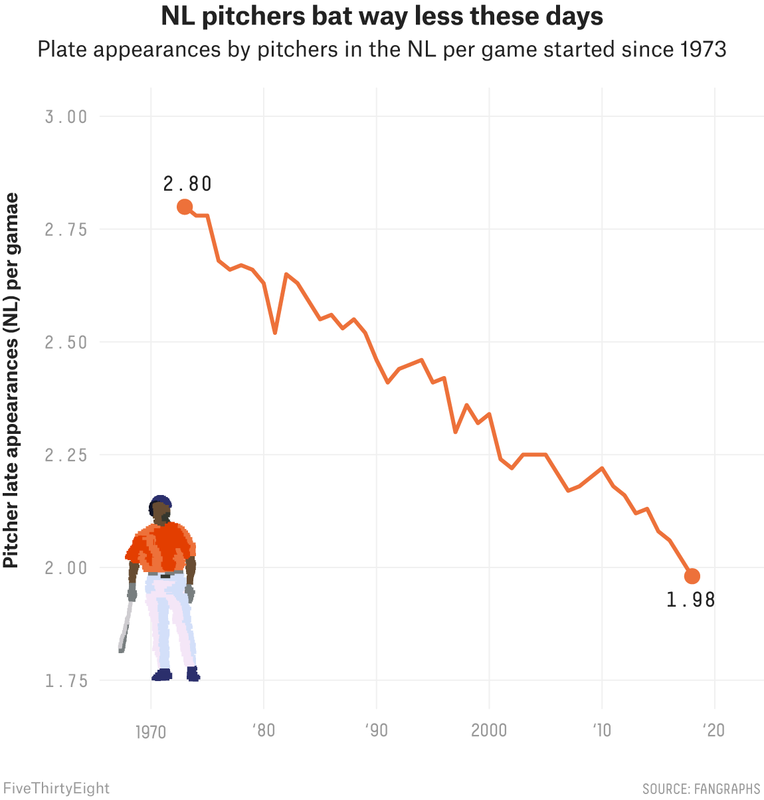 It’s a baseball truism that pitchers are terrible at the plate, but throughout baseball history, they’ve gradually gotten worse. They are now historically bad. We can measure pitchers’ offensive production using a stat called weighted runs created plus, or wRC+.1 While most positions have been producing more or less the same amount of offense over the course of major league history,2 pitchers keep declining. Last season, pitchers broke the previous year’s mark for offensive ineptness, combining for a record-low wRC+ of -25, meaning they were 125 percent worse than a league-average hitter. Unsurprisingly, DHs are better at the plate. Over the past three years, DHs have averaged a wRC+ of 109. So it’s natural to assume that the league that employs a designated hitter would score more than the league that instead uses pitchers as batters. And the AL has historically seen more runs per game. 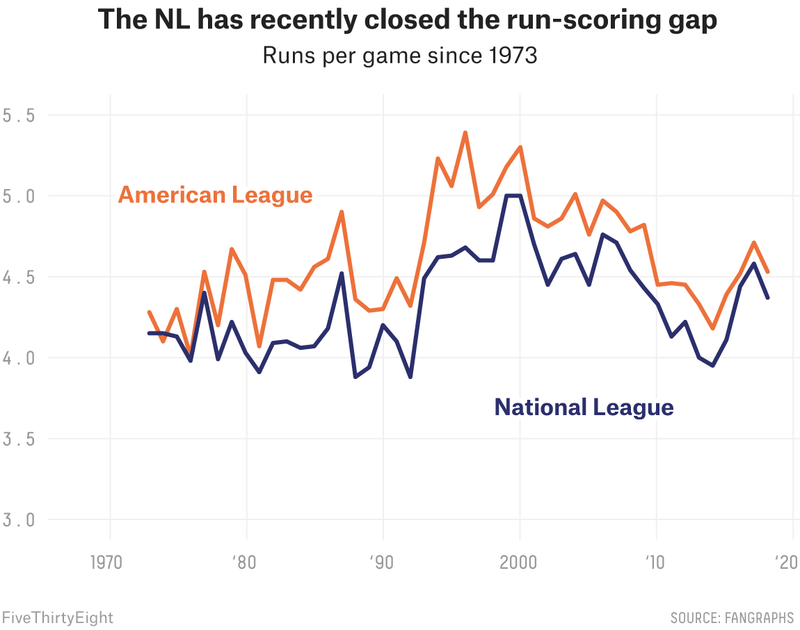 But recently, the difference in run scoring between the two leagues has shrunk. Overall, AL teams have combined to average 4.59 runs per game over the past three years, while NL teams have averaged 4.46 runs per game. From 1994 to 2003, the peak of the so-called Steroids Era, the AL advantage in runs per game averaged 0.37. Over the past four years, the advantage has been 0.12 runs. That pitchers bat in the NL is always going to handicap teams’ ability to score, given how bad pitchers are. But pitchers are getting fewer opportunities to be automatic outs. The innings logged by starting pitchers continue to decline, and NL pitchers combined for a record low total of plate appearances last season. Would NL starters pitch more if there were a DH? It’s easy to assume that because starting pitchers in the NL are sometimes pulled so pinch hitters can bat, they’d pitch for shorter stints than AL pitchers do. 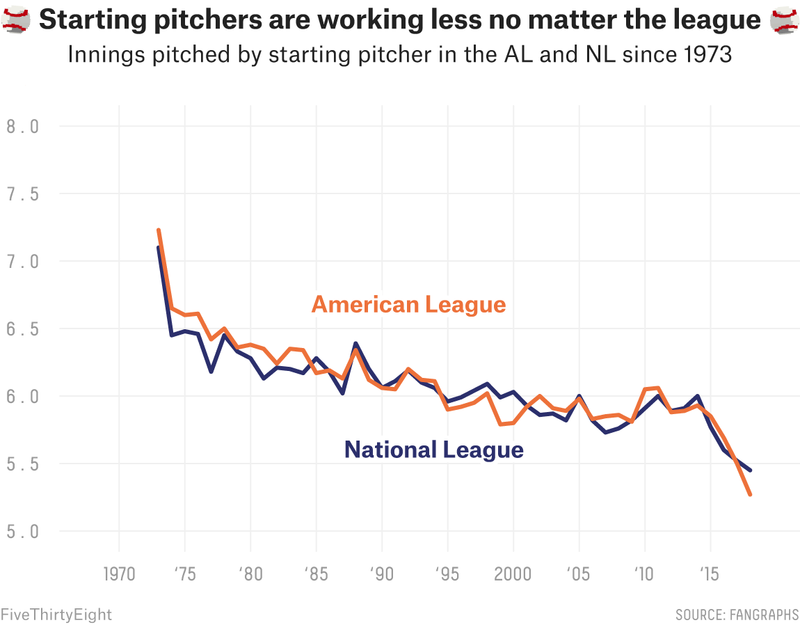 Yet starting pitchers in the NL actually worked deeper into games last season, and the leagues have been almost even in innings per start since 2000. Perhaps the predominant factors are the starting pitcher’s pitch count and how many times he’s worked through the opposing order. How would NL teams fill the DH position? In adding the DH, NL teams would be presented with essentially two choices: Fill the spot with an offense-first player who fits in the lineup daily, or use the spot to rotate and rest players, enhancing roster versatility and building a deeper bench. In the AL, teams largely employ players whose prime responsibility is to be DH. In each of the past three seasons, there were at least 12 AL teams with a player who made at least 50 percent of his 350-plus plate appearances as a DH. One factor that could be a part of the union’s eagerness to add the DH to the NL is the hope for additional higher-paying jobs. The designated hitter is, per player, the highest-paid positional group in baseball. Adding a full-time DH, as many AL teams employ, might mean better-paying jobs if the DH could replace a cheaper-salaried, end-of-the-bench position. Moreover, the DH would likely help some 30-and-older free agents find jobs — an issue in recent offseasons. If an aging player is losing defensive ability but can still hit, the DH offers another way to get in the lineup. As for the trickle-down effect on the rest of the roster, AL teams have combined to average 387.7 pitchers used per season over the past six years. NL teams? 383.7. So while adding the DH might eliminate an end-of-bench utility position, it may not have much effect on the number of pitchers used throughout a season. What would the universal DH mean for pace of play? Of course, any rule change can bring unintended consequences. Manfred has made hastening pace of play a focus, including reducing the number of trips to the mound and experimenting with a pitch clock this spring. But it’s unclear what kind of effect adding the DH would have on pace. 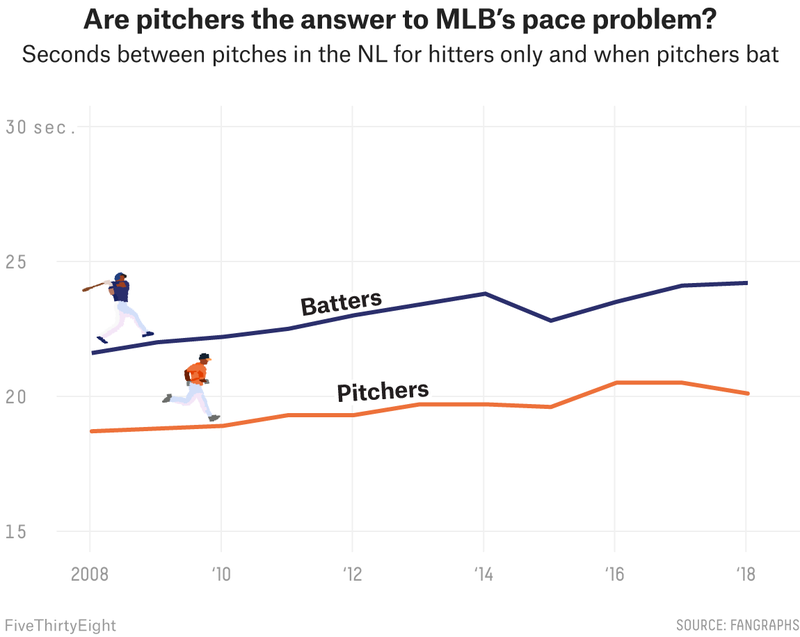 The average number of seconds between pitches last year was 24.1, the second greatest lull of the pitch-tracking era.3 The two leagues weren’t that different: Pitchers in the NL took 23.9 seconds between pitches, while the AL pitchers took 24.3 seconds. But when pitchers batted, the game sped up. The time between pitches was 20.1 seconds last season when NL pitchers hit but 24.2 seconds when all other NL hitters were at bat. But given what we know about how often pitchers bat, that doesn’t amount to much. There were 18,344 pitches thrown to pitchers last season, for a total of 20.9 hours saved between pitches over the course of a season compared with the pace of league-average pitcher-batter encounters. Nearly a full day of baseball! Except baseball is played on too many days for that time savings be noticeable. Spread over the course of an entire season, replacing pitcher at-bats with those from a DH would lead to a relatively small slowing of about a minute per game. But adding the DH could add time savings if it were to reduce midinning pitching changes. According to data provided to FiveThirtyEight by David Smith of Retrosheet, midinning changes added about 3 minutes and 15 seconds per game in 2018. But the NL had fewer midinning pitching changes last season (2,213) than the AL did (2,452). Still, the overall net effect might be modest: The average length of a nine-inning game in the NL over the past three years was 181.7 minutes. In the AL, it was 182 minutes. Would pitchers’ jobs get more difficult? NL pitchers may have to work a bit harder if the DH arrives in the league. When a pitcher faces another pitcher, the velocity of his fastball tends to decline, which suggests that pitchers give themselves a bit of a breather. The average fastball velocity in the NL last season was 93.7 mph, but when pitchers batted, it was 92.8 mph. Moreover, the NL average for four-seam fastball usage was 39.1 percent last season, but when pitchers were batting, that share jumped to 51.8 percent — a record during the pitch-tracking era. That suggests pitchers are saving their breaking balls for tougher hitters. Which NL players would benefit the most? In the table below, you can see which player on each team would become the primary DH under the OOTP simulations and which player would gain the most plate appearances. Sometimes that player would be the DH, and sometimes he would be someone else because of the trickle-down effect of opportunity gained from adding the DH. Which NL players would benefit from a DH in 2019? Interestingly, the top would-be gainers in plate appearances on eight of 15 NL teams were below average (wRC+ 100) in offensive production in 2018. In the AL last season, 13 of 15 teams enjoyed above league-average production from the DH position. That means a number of NL teams could benefit from adding effective hitters, which could lead to more free-agent spending. So, what does all this mean for the never-ending debate about what a universal DH would do to baseball? Proponents could look at all this and say, “What’s the big deal? The game would barely change! Why not officially standardize it?” Opponents, meanwhile, could look at all this and say, “What’s the big deal? The game is practically the same already! Why change it?” And perhaps that shows what the debate over the DH is really about: the culture of baseball. While the underlying evidence shows that the leagues are increasingly the same, the identities of them aren’t. Change the DH and a style of baseball would be gone forever. Even if the game itself might barely change. Next articleWhy Are There So Many Bats At Spurs Games?